What is the first thing that you think of when we say “home improvement”? Do you visualize large construction projects, DIY improvements, and grand reveals? How about costly mistakes and unforeseen issues with old wiring and poor insulation? It’s enough to make you wish you had never even considered upgrading your home. Before you give up on the dream, let us introduce you to a new perspective: simplicity and intentionality. Your home has the power to be your safe place, a miniature world within four walls that you’ve created bit by bit to tell your story. It could be a private sanctuary, where you can tune out the chaos of life and turn inward, able to examine your soul in the silence. It doesn’t take a large savings account or a professional designer to achieve the look and feel that you desire. All you need are a few intentional pieces to upgrade your home on a budget. Nothing says “comfort” like a well-scented home. Scent is inextricably tied with memory, and whether you have a family, a roommate, or if you live solo, you’ll want to remember every moment in the home that you’ve created with the people you love. Candles are a great option to upgrade your home on a budget, as they’re relatively inexpensive, can fill your home with warmth and a lush, dimensional scent, and act as decor in their spare time. Look for unique scent combinations like the Rosemary + Lemon candle from Slow North to brighten up your kitchen, or opt for Grapefruit + Spearmint to add a crisp citrus aroma to your living room or entryway. Your guests will be drawn in by the alluring fragrance, and leave with the memory of a luxe environment in their minds. You have plenty of art and decor options to choose from when you’re upgrading your home on a budget. Mass retailers have rows upon rows of knick knacks, trinkets, and prints, ready to be purchased at a moment’s notice. That’s exactly the problem though - these products are mass. When you’re creating the home of your dreams, don’t you want to find something that’s a bit more personal? Forgo that quote print that you see everyone using on Instagram, and seek out an art piece that was created by a local maker or small business owner. You’ll find something rare and special, something that evokes an emotional response within you, and something that can act as a conversation starter. Think: macrame wall hangings, one-of-a-kind pottery, vintage brass candlesticks. Take your time, and be intentional when you’re on the hunt for this piece - it will speak to you when you find it. It’s time to embrace your green thumb, plant people! 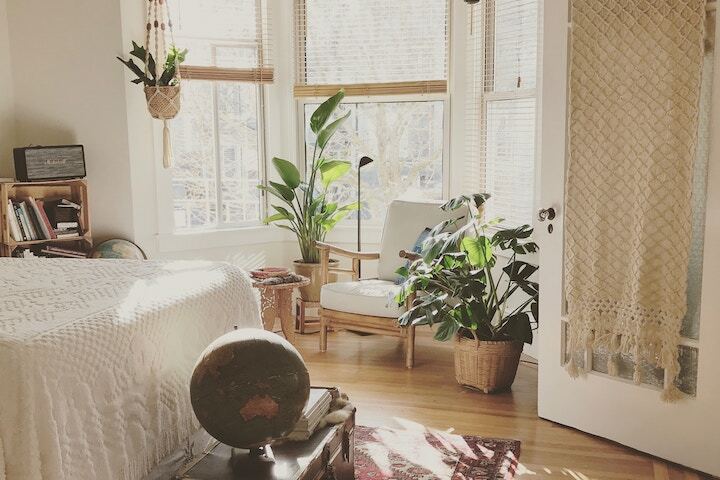 Houseplants are having a moment, but we’re of the mind that they’ve never gone out of style. Having a living thing (or multiple!) in your home not only adds a bold splash of green to your decor, it also provides a health benefit: cleaner air! Look for houseplants that are known for being sturdy (snake plants, zz plants, etc. ), especially if you aren’t particularly known for keeping plants alive. Just as important as the plants are which pots and planters that you choose. Select a variety that give you joy, from hand thrown neutral terracotta pots to vintage glass vases. Upgrading your home on a budget is possible - and it doesn’t require difficult renovations. All you need are a few key pieces to add your unique personality to your digs, pieces that will inspire your guests and leave a lasting impression. By intentionally incorporating items that tell the story of you, you’ll elevate your home, creating the private sanctuary that you’ve been seeking with ease.